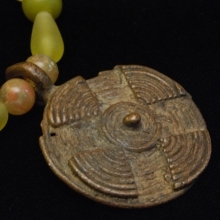 Necklace made of jade, bronze, wood and resin. 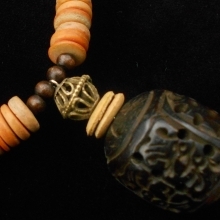 Origin of bronze beads: Côte d'Ivoire. 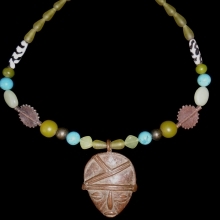 Mask necklace with a bronze medallion of West Africa. 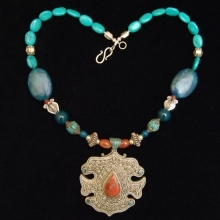 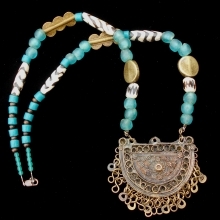 The beads are made of bone, resin, bronze and semiprecious stones (Turquoise and Jade). 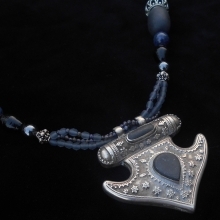 Long necklace in wood, silver and stones- Sodalite and Lapis-lazuli. 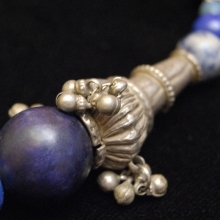 Big old silver beads from Rajasthan. 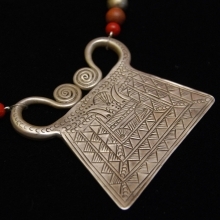 Silver and stone pendent from Turkménistan. 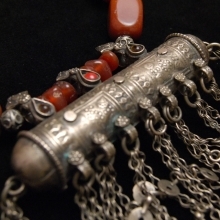 Old amulet from Indonesia assembled with Berber pearls and semiprecious stones : red Jasper, Cornaline, red coral and Aventurine.